Update (Nov 29): the plugin was open-sourced on our GitHub repository. JEB 3.0.7+ is required to load and run it. Java applications can call native methods stored in dynamic libraries via the Java Native Interface (JNI) framework. Android apps can do the same: developers can use the NDK to write their own .so library to use and distribute. In this post, we briefly present how the binding mechanisms work, allowing a piece of bytecode to invoke native code routines. The native method name adheres to the standard JNI naming convention, allowing automatic resolution and binding. JEB automatically binds those methods together, to allow easy debugging from bytecode to native code. However, there is another way to bind native code to Java. One can decide to bind any function to Java without adhering to the naming convention, by using the JNIEnv->RegisterNatives method. Due to its dynamic nature, statically resolving those bindings can prove difficult in practice, e.g. if names were removed or mangled, or if the code is obfuscated. Therefore, not all calls to RegisterNatives may be found and/or successfully processed. However, JEB 3.0-beta.2 (to be released this week) ships with an EnginesPlugin to heuristically detect – some of – these methods, and perform binding – and of course, you will also be able to debug into them. 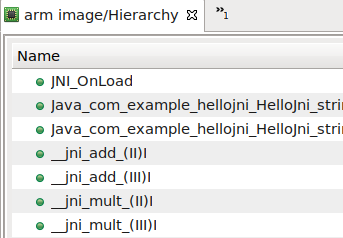 The first is the simplest one: the JNIEnv->RegisterNatives method is commonly called from the standard JNI initialization function JNI_OnLoad, so JEB searches for this method and attempt to find calls to RegisterNatives. Even if accurate, this method does not work when a Branch is issued via a register (BL R4) or method name is hidden. 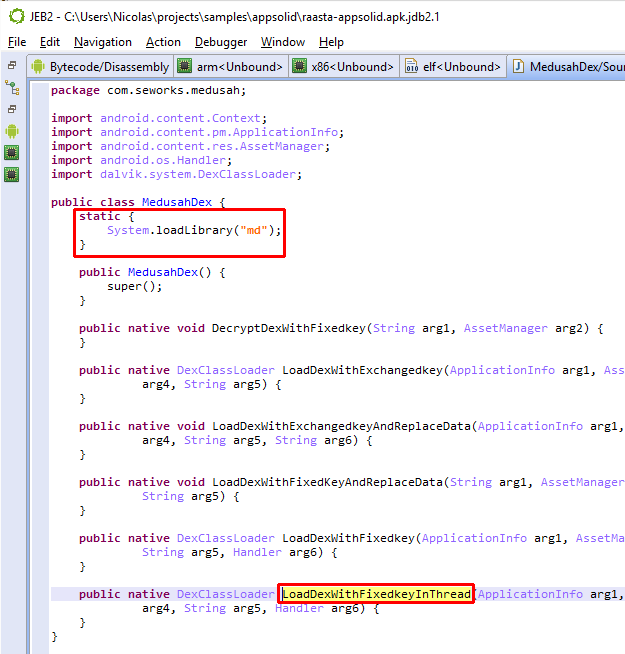 If found, the plugin looks at cross references of this String and checks if it looks like the expected JNI structure. The third and last heuristic is the same as the previous one, but based on arguments. Since names can be shortened, they may not be interpreted as String, and thus not referenced, whereas it is easier to find argument signatures. These three heuristics only work when methods are defined as a static array variable. Dynamic variables would need some emulation of the JNI_OnLoad method to be resolved. As you can see, detection is currently based on heuristics, so obfuscated methods may be missing. Feel free to tweak and improve the plugin, it is available on our GitHub repository. As usual, feel free to reach out to us (email, Twitter, Slack) if you have questions or suggestions. 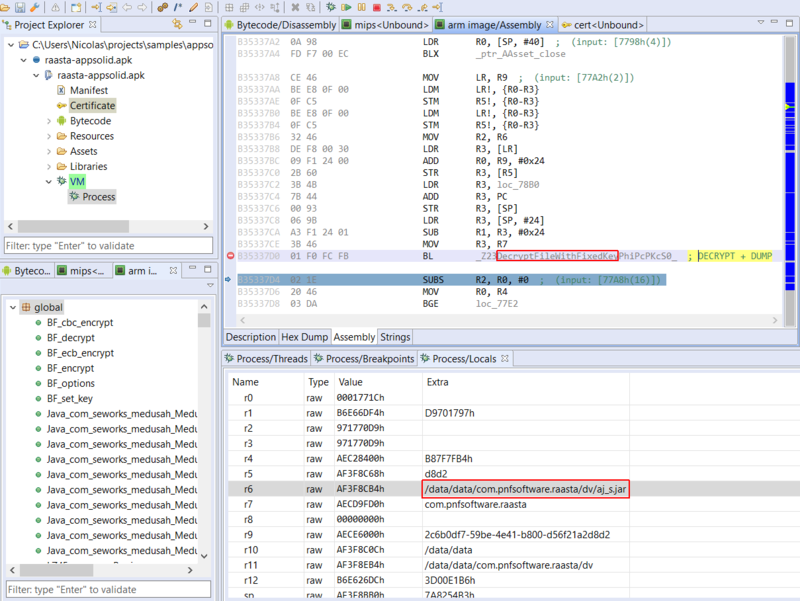 The JEB 2.3.2 release contains several enhancements of our JDWP and GDB/LLDB1 debugger clients used to debug both the Dalvik bytecode and native code of Android applications. Now, we want to debug that additional bytecode. How do we proceed? The app is called EnDyna (a benign crackme-like app, download it here). It offers a simple text box, and waits for the user to input a passcode. When entering the proper passcode, a success message is displayed. Open the app in JEB. It contains a seemingly-encrypted asset file called edd.bin. A closer look at the MainActivity class shows that the edd.bin file is extracted, decrypted (using a simple XOR cipher) and loaded using DexClassLoader in order to validate the user input. 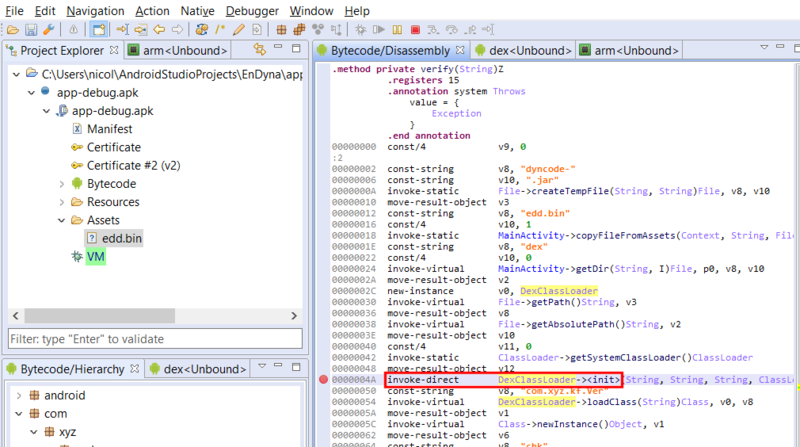 Let’s attach the debugger to the app, and set a breakpoint where the call to the DexClassLoader constuctor is made. We then trigger the verify() routine by inputting a passcode and hitting the Verify button. Our breakpoint is immediately hit. By examining the stackframe of the paused thread, we can retrieve the class loader variables and see where the decrypted DEX file was written to – and is about to get loaded from. We use the Dalvik debugger interpreter to retrieve the file (command “pull”). We now have the Jar file containing our dynamically-loaded DEX file in hand! We load it in JEB by adding an additional artifact to the project (command File, Add an Artifact…). 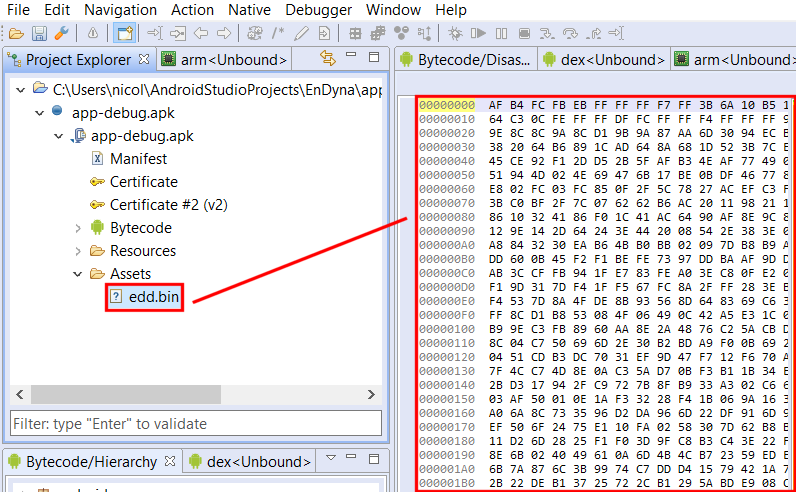 After processing is complete, the Android debugger notices that the added artifact contains a DEX file, and integrates it in its list of managed units. The second DEX file; notice the decompiled chk() method on the right-side. Here, we set a breakpoint on the method’s first instruction. It’s about to be called from MainActivity.verify(), in the primary classes.dex file. We resume execution, our breakpoint is hit: we can start debugging the dynamically dropped DEX file! We published a short video that demos the above steps, have a look at it if you want to know precisely the steps that we took to get to debug the additional DEX file. Thank you – stay tuned for more updates, and happy debugging! 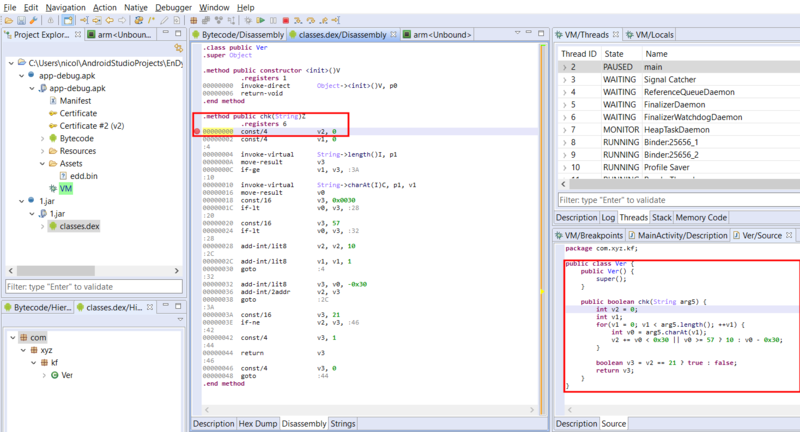 This blog is a follow-up to the original debuggers tutorial published here. 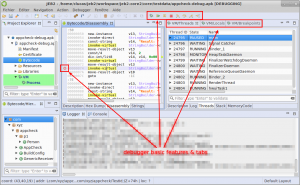 It focuses on the debuggers’ command interpreters, and how to use the new advanced features introduced in JEB 2.2.10 to make the most out of your live debugging sessions. The first command to learn is help: it lists all the available commands. 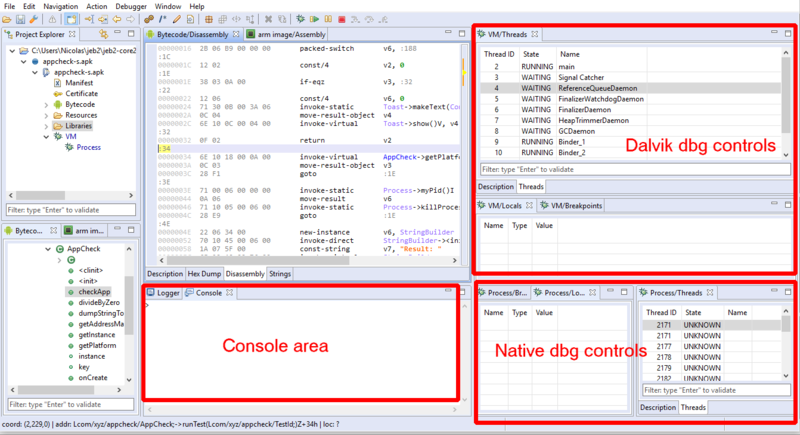 The Console part, as well as the Logger part, is common to all debuggers. So the first step is to select the debugger to work with. 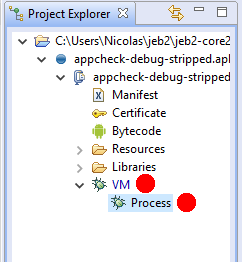 In this case, we have 2 active debuggers: VM (for java code) and Process (for native code). 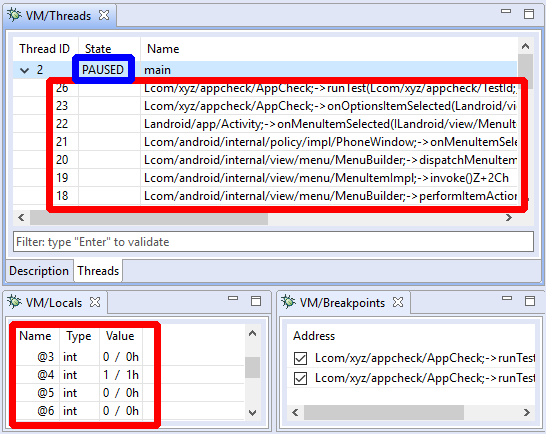 Let’s connect to the VM debugger (it is always available when you debug an android project). Type use 1. The prompt changes to indicate the current debugger. Use exit to go back to root level. There are 2 types of commands in the VM interpreter: thread related commands and object interaction commands. Here is a summary of the thread management commands. It consists of a set of debugger basic features that are available in the UI: resume, step, manage breakpoints. By pressing enter without any command, you can repeat the same action, which is pretty handy for step actions. To get more help on a command, type “help $command$”, there will be a full description of it. any object that can be referenced from these ones. JEB interpreter supports auto completion using TAB key. -t threadId to select the thread. Remember that you can see all threads with command threads. -f frameIndex to select the frame. By default, the top frame is used. The read command provides the same features as the VM/Local tree using the command line. All commands implement the -b option that prints out a brief output in one or two lines. VM> set this.mystring "new content"
Finally, the call command allow invoking any method on objects or classes. Arguments must be separated by commas. Visit the JEB public Google groups if you have additional questions on how to use the debuggers’ interpreters. Thank you for your support. 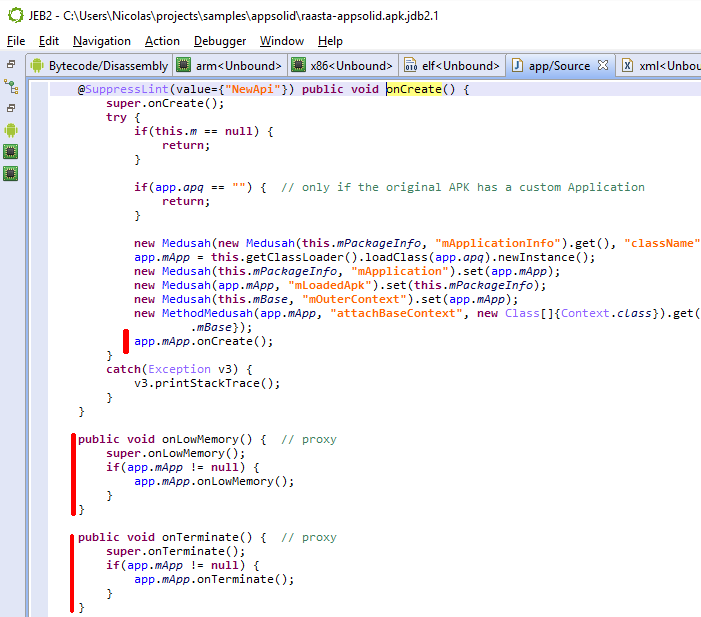 AppSolid is a cloud-based service designed to protect Android apps against reverse-engineering. According to the SEworks’ website, AppSolid is both a vulnerability scanner as well as a protector and metrics tracker. 1 This post focuses on the protector part only. Note: AppSolid offers various protection options. However, based on our limited testing, it turns out that protected apps can be easily un-protected. The founder of SEworks said on the ProductHunt’s description page: “We looked at Proguard and Dexguard for our own app, and source code obfuscation just wasn’t enough (plus that makes crash logs hard to read), and solutions like Arxan cost a lot of money and required weeks of our time to integrate into the app. ” While the above is essentially true, the implication is that AppSolid fares better than “source code obfuscation”. He adds: “Why not create a shield that goes around the app to protect it, and is easy to use?” – that is the core issue that AppSolid is facing. 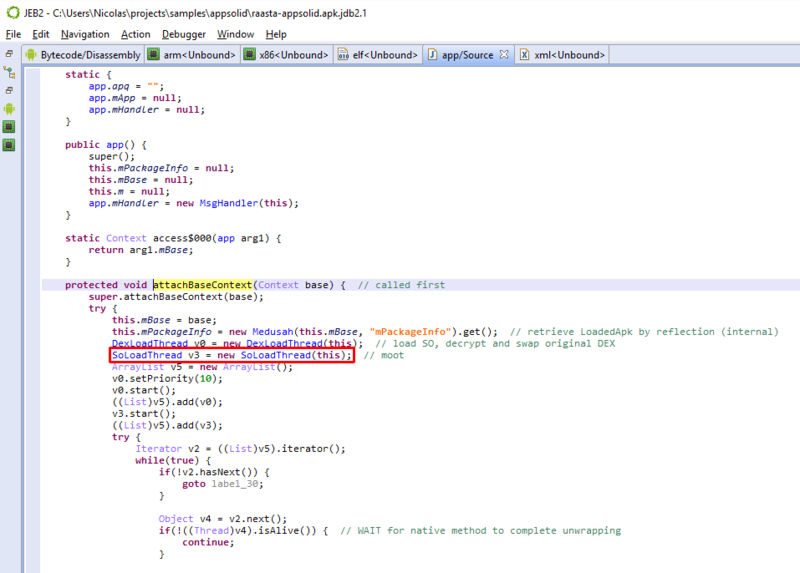 A commenter added that “(AppSolid) does a good job of protecting against source code analysis through app decompiling”. That claim is false, but remained undisputed on the ProductHunt page. 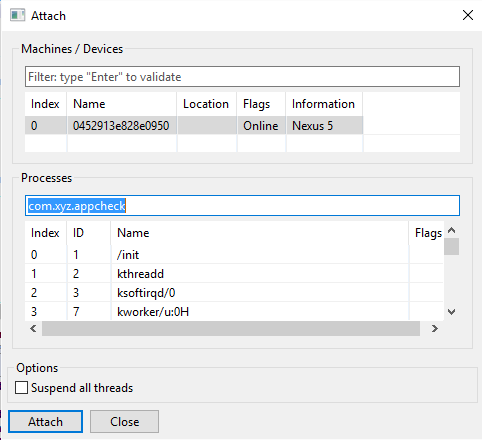 This blog shows how to retrieve the original bytecode of a protected application. Grab the latest version of JEB (2.2.5, released today) if you’d like to try this yourself. Note that the app is not debuggable, but JEB handles that just fine on ARM architectures (both for the bytecode and the native code components). You will need a rooted phone though. The app structure itself changes quite a bit. Most notably, the original DEX code is gone. Structure of the protected app. The fake PNG file contains encrypted assets of the original app, which are handled by libmd.so. Setters and getters via reflection to retrieve system data such as package information, as well as stitch back the original app after it’s been swapped in to memory by the native component. The main activity com.seworks.medusah.MainActivity, used to start the original app main activity and collect errors reported by the native component. The protected app shipped with 3 native libraries, compiled for ARM and ARM v7. (That means the app cannot run on systems not supporting these ABIs.) We will focus on the core decryption methods only. Retrieving the decryption key statically appears to be quite difficult, as it is derived from the hash of various inputs, application-specific data bits, as well as a hard-coded string within libmd.so. It is unclear if this string is randomly inserted during the APK protection process, on the server side; verifying this would require multiple protected versions of the same app, which we do not have. A dynamic approach is better suited. 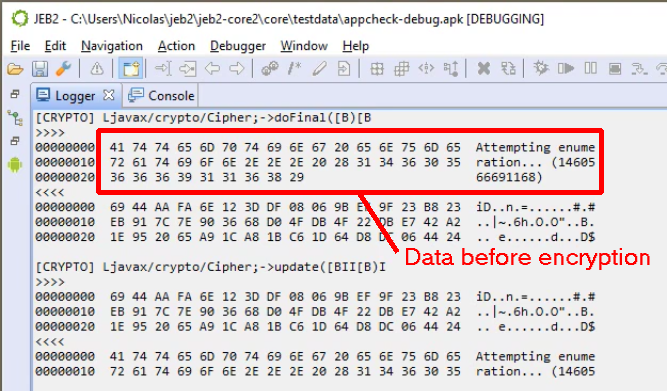 Using JEB, we can simply set a breakpoint right after the decryption routine, retrieve the original DEX file from disk, and terminate the app. The native code is fairly standard. A couple of routines have been flattened (control-flow graph flattening) using llvm-obfuscator. Nothing notable, aside from their unconventional use of an asymmetric cipher to further obscure the creation of various small strings. See below for more details, or skip to the demo video directly. phi is picked small (20) making the discovery of d easy (3). The above is a simple example of white-box cryptography, in which the decryption keys are obscured and the algorithm customized and used unconventionally. At the end of the day, none of it matters though: if the original application’s code is not protected, it – or part of it – will exist in plain text at some point during the process lifetime. The following short video shows how to use the Dalvik and ARM debuggers to retrieve the original DEX file. This task can be easily automated by using the JEB debuggers API. Have a look at this other blog post to get started on using the API. The Jar file aj_s.jar contains the original DEX file with a couple of additions, neatly stored in a separate package, meant to monitor the app while it is running – those have not been thoroughly investigated. Overall, while the techniques used (anti-debugging tricks, white box cryptography) can delay reverse engineering, the original bytecode could be recovered. Due to the limited scope of this post, focusing on a single simple application, we cannot definitively assert that the protector part of AppSolid is broken. However, the nature of the protector itself points to its fundamental weakness: a wrapper, even a sophisticated one, remains a wrapper. Updated on May 4: JEB 2.2.3 is out. 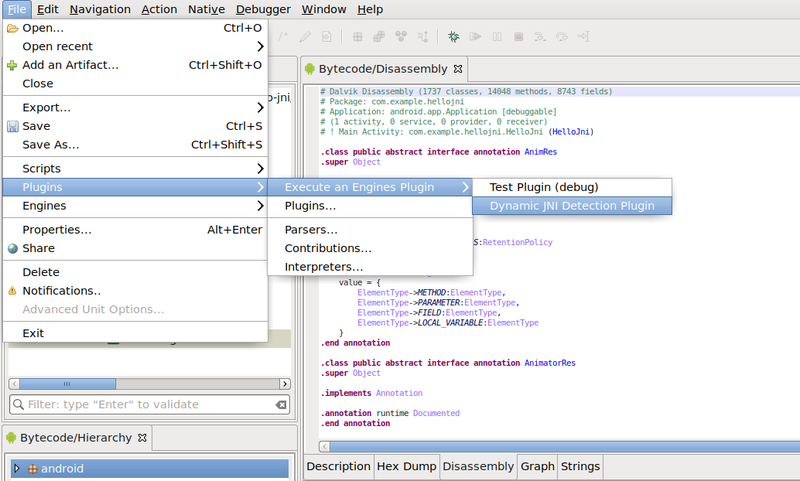 All users can now use the Android debugger modules. 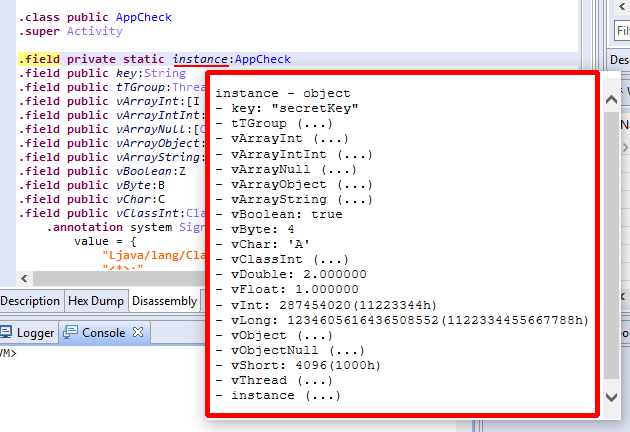 In this short post, we will show how the debuggers API can be used to monitor an app execution, hook into various key methods and classes of the standard Java cryptography SPI, and extract input and output data, as they flow in and out encryption/decryption routines. The sample code of the AndroidCryptoHook plugin can be found on our public GitHub repository. The hook here consists of a double breakpoint, one triggered when a method is entered, another one, when it exits. The code for that Java plugin is fairly simple. More hooks could be easily added, and hooks in native libraries could be set up in a similar fashion. Lastly, always keep in mind that the API in general (and this plugin in particular) can be leveraged by UI or headless clients. Automate things away if you need to. The one and only entry-point for developer resources is our Developer Portal. Do not hesitate to reach out, publicly or privately, if you have issues or pointed questions. Thank you. 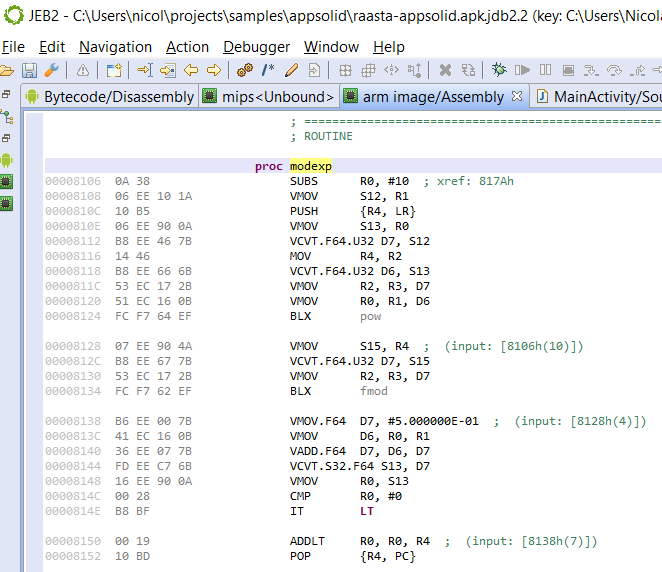 Disassemblers for Intel x86 and x86-64, ARM 32-bit (including floating point support), ARM 64-bit (Aarch64) and MIPS. In this post, we will dive into some of the details and caveats pertaining to the Android debuggers, how to use them, explain their current limitations, and present our roadmap regarding future additions and improvements. An on-going debugging session of Android Dalvik and native ARM code. Debugging closed-source Android apps has historically been challenging at best, close to impossible at worst. 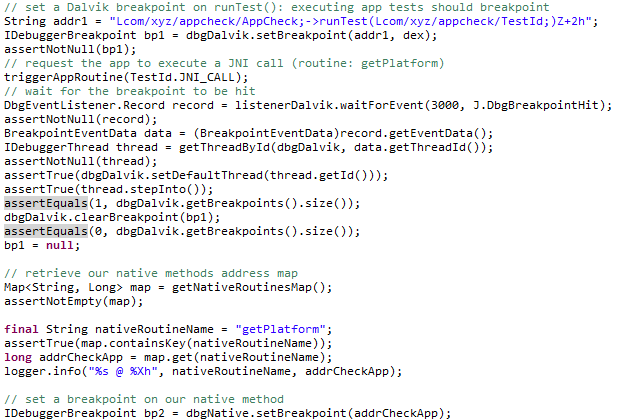 JEB took a stab at solving this problem by abstracting away a wealth of low-level details and caveats related to debugging so that analysts can focus on the Dalvik code and associated decompiled Java source, as well as native code. 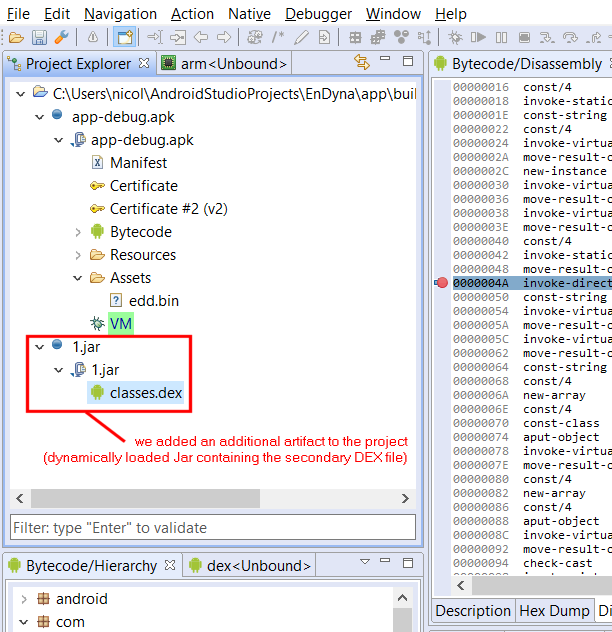 The Android debuggers make the task of reverse-engineering complex apps, e.g. those using a mix and bytecode and machine code, finally possible in practice. With the rise of app protectors and obfuscators, support for full-scale debugging has become more and more pressing. Earlier in February, we published a video highlighting one major feature of these debuggers: the ability to seamlessly debug to-and-from Dalvik and native code. We will explain in details how to use the features highlighted in the video. Another area we will explore is the debugging API. The debuggers abide to the JEB IDebuggerUnit family set of interface. They can be used to automate debugging tasks, and allow for easy integration in analysis pipelines. Make sure to have the Android SDK installed. 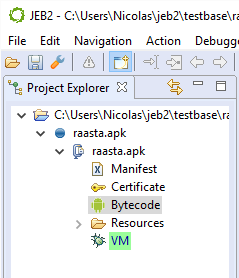 Ideally, you also want to have an %ANDROID_SDK% variable pointing to the SDK folder. Enable Developer options and allow USB debugging on the intended physical target device. (Debugging is enabled by default on the emulators.) On physical devices running Android 4.2 and above, one way to make sure of that is to run the adb devices command. If the device is shown as unauthorized, a pop-up on your phone will appear to request authorization. 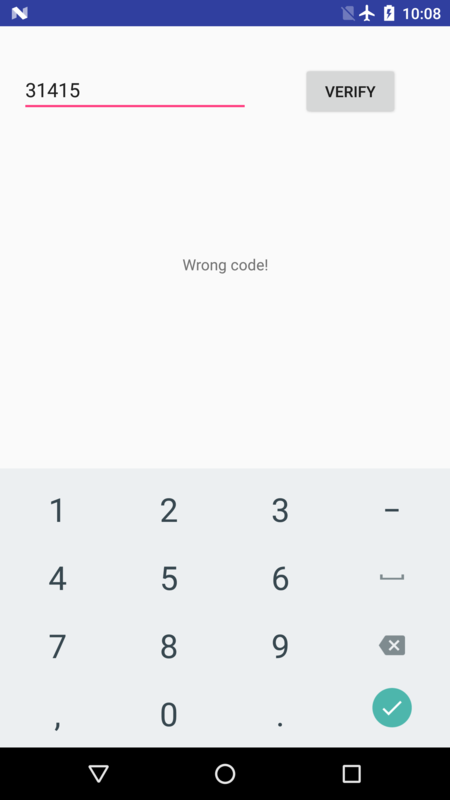 Normally, only apps whose Android Manifest explicitly has a debuggable flag set to true are debuggable. However, this is rarely the case when analyzing in-the-wild applications, malicious or otherwise. In such cases, you have several options. Run the app in an emulator. Emulators have the ro.debuggable property set to 1. This means they will debug all apps, regardless of the debuggable flag in the Manifest. Use a rooted phone. A rooted phone will allow you to modify the ro.debuggable property, and change it from 0 (standard on production devices) to 1. The rooting process is out-of-scope for this document: it is device specific and rooting instructions can easily be found online. As for ro.debuggable, we will explain how to change this system property in a separate blog entry. When it comes to debugging native code of non-debuggable apps on a rooted phone or emulator, other limitations apply. 2 JEB tries its best at abstracting them away. However, things might be unstable depending on which phone and OS is being used. Do not hesitate to let us know if you encounter issues. Note that most of our tests are done on Nexus devices running vanilla Android 5.1 and 6.0. Using similar devices for debugging will likely reduce the chances of running into corner-case problematic situations. 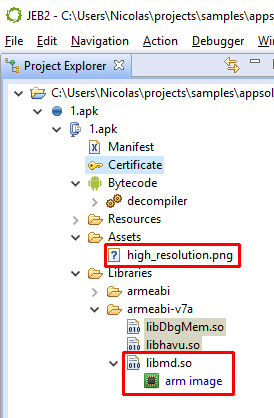 Currently, JEB can start Android debugging sessions only when analyzing APK files. If your main artifact in JEB is an orphan DEX file, the UI client will refuse to start a debugging session. The Debugger/Start, used to start or attach a debugger, is available once the code view of a support Code unit has the focus. Here, the focus was on Dalvik bytecode. Select the target phone and the target process that matches your app, and click Attach. Unless you tick the “Suspend all threads”, The app will be immediately be run/resumed after attaching. The process filter is normally filled out with the APK package name. Simply press enter to filter out entries. Your entry must have a D flag. This flag indicates that the target device will accept incoming debugger-attach requests to the target process. If you are trying to attach to an entry that does not have this flag, the operation will fail. After attaching, the app, you should see one or two additional nodes in the Project tree view. When a debugger is successfully attached, the corresponding node has a light green background. Layouts can be customized via the Window menu; more details can be found in a previous blog entry. The debuggers should now be attached. Keep in mind that pausing the Process debugger (ie, suspending the native threads) will obviously freeze the higher-level Dalvik VM! Next up, let’s review the debugger controls and controls. The most important thing to remember about debugger controls is that the UI controls affect the debugger related to the view currently focused. 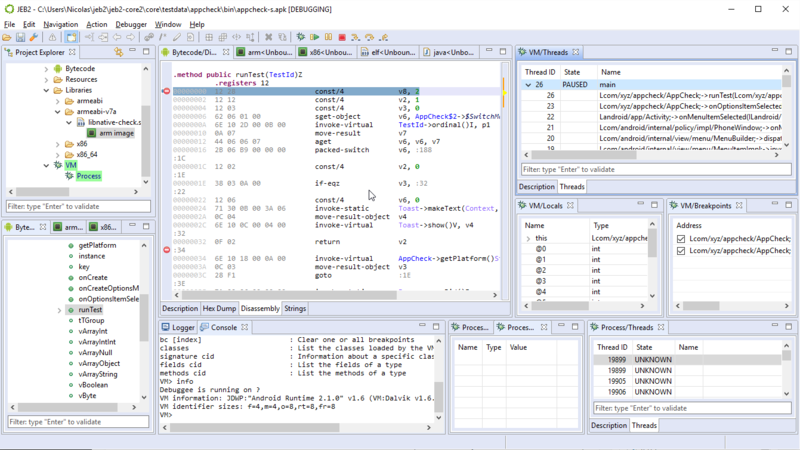 Unlike most tools, JEB allows multiple debuggers and debugging sessions to take place at once. 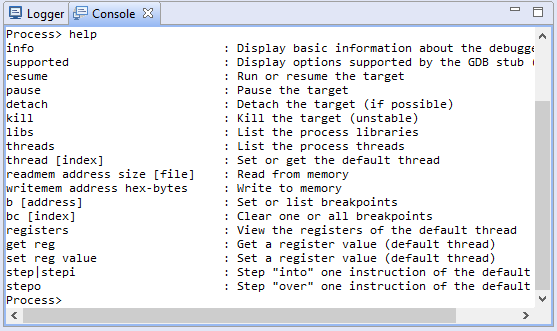 Therefore, be mindful of which debugger is being controlled when pressing menu entries or toolbar buttons: If the focus is within the DEX view or any VM debugger view, the controls are connected to the VM debugger; if the focus is within a code view connected to the Process debugger, the controls are connected to the Process debugger. The toolbar contains a subset of the most common and useful controls, that are also accessible via the Debugger menu. Not all controls can or are implemented for all debuggers. Currently for instance, pausing individual threads of the Process debugger is not possible. When a control is not available, depending on which control it is and the severity of the failed operation, the user may be unable to activate it (eg, grayed button), receive an error in the logger, or receive a pop-up error in the client. Breakpoints can be set/unset using the handy Control+B (or Command+B) shortcut. An icon is displayed in the left vertical bar of a code view to represent enabled/disabled breakpoints . One enabled and one disabled breakpoints. The Threads view displays thread identifiers, status (running, suspended, waiting, etc.) as well as the stackframes when a thread is paused. Depending on the target processor, there may be one or more stackframes, showing the location (program counter register or address) of the current thread. 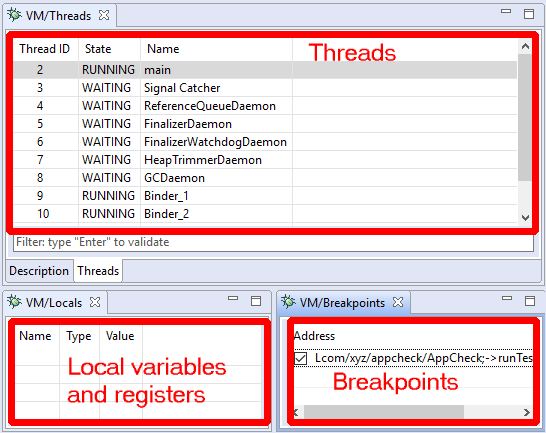 The Locals view shows the generic variables registers. They can be virtual slots of a VM, registers of a native process, complex variables inferred by the decompiler, etc. 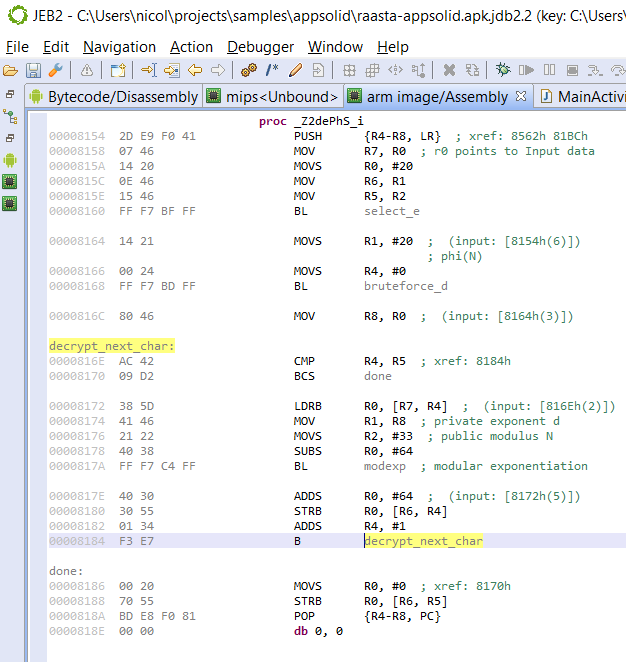 Debugger views of a paused Dalvik VM. Stackframes are visible, along with some local variables. Every debugger has specifics that are relevant to the target being debugged. While the JEB API and front-end are trying to abstract the nitty-gritty details away, there are times when generic controls are not enough. In the next section, we discuss how users can issue such commands via the debugger console. In the case of local variables, the type of a Dalvik slot (v0, v1, etc. ) is usually inferred thanks to the Dalvik decompiler. A JEB build that does not ship with the decompiler will not be able to display most frame variables accurately. When a thread is paused, the debuggers (native as well as Dalvik’s) provide overlay information when the mouse cursor hovers over registers, variables, class fields, or any other visual element that holds data. 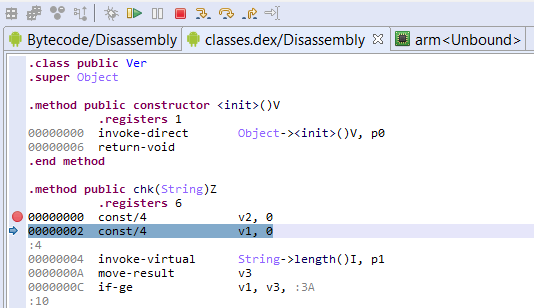 In the case of the Dalvik debugger, overlays also work in Java decompiled views. The debugger units make use of the IUnit.getCommandInterpreter method to provide clients with command interpreters to execute advanced debugger commands, that may not be readily made available by graphical clients. An interpreter has a numeric id as well as the name of the unit that created it. Switch to an interpreter with the use <id|name> command. The special command help, available in all interpreter contexts, lists all commands made available by the interpreter currently in use. In this example, we can see that the Process debugger offers ways to read and write to memory, set registers, and also issue low-level GDB commands (use this option carefully). The Android debuggers offer options to control low-level debugger parameters, such as ports and timeouts. If you wish to disable native debuggers entirely, set the DoNotUseNativeDebugger to true. 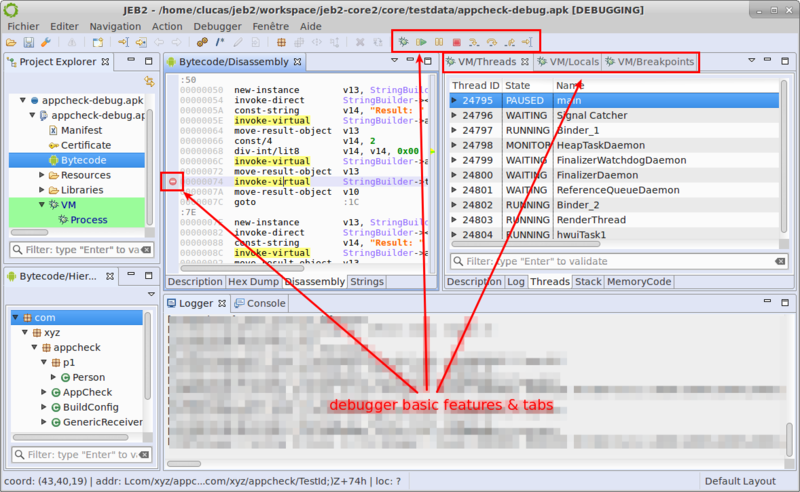 Debugger modules in JEB implement the set of interfaces contained in the com.pnfsoftware.jeb.core.units.code.debug public package. The principal interface in this package is IDebuggerUnit. Plugins, scripts, or third-party clients wishing to automate the usage of debuggers can us these well-defined interfaces. The official UI client uses this public API. Anything that the UI client does (and more) can be done and/or automated by third-party code. Check out our post on Android crypto primitives hooking to see how the API can be used to retrieve pre-encryption or post-decryption data on the fly. Within the next couple of weeks, we will upload sample code on our GitHub repository demonstrating how to use the JEB Debugger API.